In the wake of the Parkland, Florida shooting at Marjory Stoneman Douglas High School, students, parents, and supporters gathered in cities across the country to protest gun violence and the lack of action from Congress. 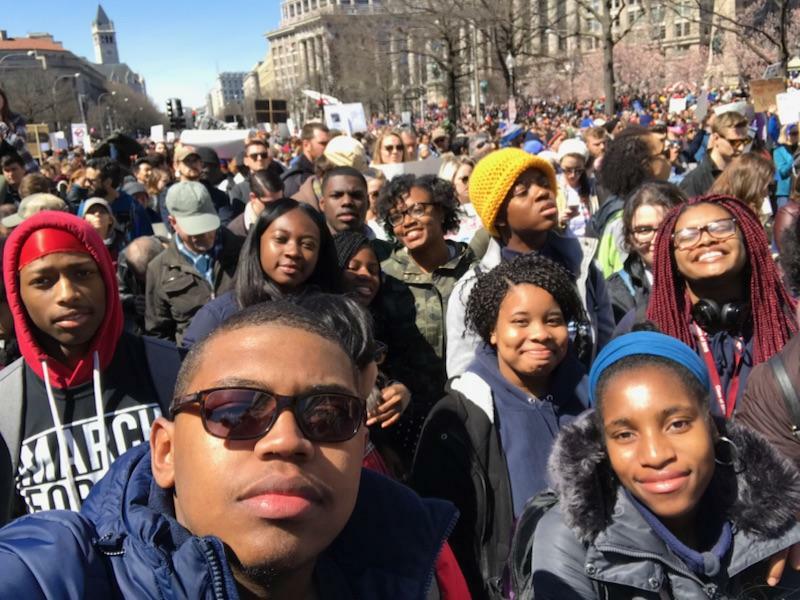 Several students from KIPP Newark Collegiate Academy traveled to the March for Our Lives event in Washington DC on Saturday, March 24th to participate. Here are some of their reflections. Today made me realize that young adults like me have the power to change the world because we are the future of America. Kamil Vickers, lower left, and his classmates marched in Washington DC at the March for Our Lives rally. The movement inspired me to continue to continue the march in my own community. Yes, adults play a major role, but as kids we have power. Our future in this country will be bright once our generation puts their voice to use. – Kamil Vickers, Student Body President, 11th grade. After participating in the movement, I realized that change doesn’t require power or money, it only requires empathy and courage. The peaceful protest today made me appreciate my youth even more and realizing that it doesn’t matter what your background is we can still unite and forcefully fight for what we deserve, with the most powerful weapon, our voices. Today I felt honored to be a part of history. Throughout the day I saw many clever posters that were both humorous and heartfelt. The catalyst of this march was the brutal murder of 17 people in Parkland, Florida. The tragedy incited young leaders to organize protests that would polarize the nation. When I was there today it was hard to remember the separations between us, the racism, prejudice, and gender bias. Today I was united under one cause, to stand in solidarity with my peers in pushing for gun regulation. I was reminded the power I have to effect change in my own community. I am truly grateful to have been able to participate in the march today. It was really empowering to see people speak out and talk about their various experiences with gun violence, and I know it was very difficult for them to do so. The part of the trip that got to me the most was Emma Gonzalez’s speech and her 6 minutes. Especially because it was the only speech I really got to see because of my height, but it brought me to tears. I’m extremely happy because I know we are going to change things for the better, despite our age, and I hope adults are ready to listen to what we have to say, because we are gonna my to change things if they like it or not. Today, we were a part of something. Today, we marched along thousands of others in hope that the NRA, Congress, and President Trump as the president will ban guns in America. Today thousands of us marched… with the thought of how many more children have to die from a bullet rather than growing up going to school to get an education. Today I was honored to be a part of something so special that my generation can change. Today i am thankful to be a part of something so special and amazing in America today. We’re proud of our students who chose to spend their Saturday engaging with their government. Though they aren’t old enough to vote yet, that didn’t stop them from voicing their truths and working to be the change they wish to see in the world.